Running Vuze on Win 7, happy with install. Only onw (after years of running Vuze) I noticed that I am running the 32bit version while 64bit Vuze version is available. Would Vuze 64bit run faster/better or with any improvements compared to Vuze 32bit? If the answer is YES, what would be the migrating procedure from 32bit Vuze to 64bit version. theoretically, having your pc read 64 bits at a time instead of 32 bits should be faster, but I haven't noticed an improvement and I haven't ventured across anyone who has. Unless it causes you to lose sleep, I wouldn't bother, until someone comes along with convincing information as to why you should. If you do choose to go 64bit, do a configuration backup, uninstall the 32bit Vuze, install 64bit Java 8, then Vuze64, then restore your configuration. What you say is exactly what I intuitively thought. I was wondering if anybody actually had the 32bit, migrated to 64bit and saw a "Wow" difference (that would compel me to make the switch). Now if someone would take a shot and give me a bit of wisdom on the other topic I started at the same time with this one: VUZE not working with SSL announce (please see http://forum.vuze.com/Thread-SSL-Announce). For me, running 64 bit vuze speeded everything up, probably due to the 200+ torrents in my library. The thing is, if you/re running a 64 bit OS, then why would you want to run 32 bit software through an emulator (which is what WOW is) when you can run the software in native 64 bit mode. But it's the extra security you get by running 64 bit that's the biggest advantage. With Vista onwards, you get hardware Data Execution Protection, rather than the software only in 32 bit. Strictly speaking, you can get hardware DEP in 32 bit, but it's a bit more of a fuss than in the 64 bit versions, where it's automatically enabled. (08-02-2015, 04:51 PM)'JackBassV' Wrote: For me, running 64 bit vuze speeded everything up, probably due to the 200+ torrents in my library. I'm pushing 900 torrents (I like to keep everything seeding). Just switched system drive to SSD, I can no longer blame system drive (or swap file) for bottlenecks. It feels now that the next logical step is to migrate to 64 bit. Trying to migrate from Vuze 32bit to Vuze 64 bit. I think I need some help installing the correct version. To make sure Java 64bit was installed correctly (and as a test of some sorts), I uninstalled the 32bit version of Chrome and installed Chrome 64bit version. Uninstalll/reinstall went OK, Chrome now reports 64bit version running. Looked everywhere on the vuze.com site for a specific "64bit" version and was not able to find. Found all sorts of "Vuze 64bit" versions all over the Internet, but I do not trust any source other than vuze.com. Seeing that I do not find a specific "64bit" version on vuze.com, I figured that the regular installer will either give me an option during the install process to select 64bit version, or will do it automatically upon detecting Windows 7 and 64bit Java. So I went with the default vuze.com download button + install. Install offered to install in "C:\Program Files", which I took as an indication that it is installing the 64bit version. Finished install, did a restore. All torrents loaded OK, all settings seem to be exactly the same as before. Reading this, it seems to me that I did not migrate at all to 64bit version, I am still running vuze 32bit. (I am not sure what amd64 is, but the computer is not amd processor). Can someone please let me know if the version currently reported is vuze 64bit? If I am still in 32bit, what did I do wrong and how can I install vuze 64bit? Try looking in the vuze folder. You should see Azureus64.exe. You just need to get this to run at startup instead. (08-04-2015, 02:47 PM)'JackBassV' Wrote: Try looking in the vuze folder. You should see Azureus64.exe. I did a search on the system drive for Azureus64 to see if perhaps it was put in another place, but there is no Azureus64 file on the computer. I have a feeling that by following the default "DOWNLOAD" button I installed once again the 32bit version. Could you please indicate the download link for the 64bit version of Vuze, as I have not been able to find it. ...and just to be on the safe side, I uninstalled once again Vuze. I verified that the entire Vuze folder in C:\Program Files\Vuze was deleted on uninstall. I then looked again all over the vuze.com web site and did not find any other point of entry for 64bit vuze download than clicking on the one and only DOWNLOAD link. Just like before, there is no Azureus64.exe file. I went on to restore the last backup, just in case some of the settings were changed by the reinstall. Help from Master Parg would really be appreciated at this point! I am wondering if anyone working at Vuze is reading these posts. If they are, I have 2 questions. Could someone at Vuze pleqase respond? Is my Vuze installation at this point 32bit or 64bit? 2. If it is 32bit, and seeing that I have uninstalled (twice) Vuze, installed latest 64bit version of Java (verified that it is being used by system), and reinstalled (twice) Vuze, what is the correct procedure for installing Vuze 64bit? hey ccrisvuze, here's the link for Vuze at Sourceforge.net http://sourceforge.net/projects/azureus/...Vuze_5620/ Dont' forget to do a config backup! I note that you've checked your Java version and confirmed that it is x64. If you download the x64 Vuze, it should install and operate ok (bugs excepted of course). OK, I'll follow the links and give this 32bit to 64bit migration another try. Once again, just like I wrote before, the program was installed in the "Program Files" folder (not the "Program FIles (x86)" folder), which I took as an indication that the 64bit version was installed. Once again, the Vuze program only contains Azureus.exe (does not contain Azureus64.exe as another post suggested). Once again I am unable to determine from reading the Help>About information if the program that is running on my computer is Vuze 64bit or Vuze32 bit or some form of hybrid with 64bit and 32bit components. Once again I am asking for a VUZE representative to please interpret for me the Help>About information. I see that VUZE representatives read this forum every day and they post every day helpful replies. It is a mystery for me (and a disappointment) that I have posted this so many times and not once one of the active VUZE representatives bothered to answer. I appreciate the kindness of my peer forum members who have provided advice, but I am simply turning in circles. The Help>About information is cryptic and inconclusive. The advice provided causes me to uninstall and reinstall forever, with the same results. "Yes, you are running 64bit Vuze"
"No, you are running 32bit Vuze, you must do xxxTHISxxx for a complete 64bit install"
"You are running some components in 32bit and others in 64bit, you must do xxxTHISxxx for a complete 64bit install". I think you're worrying over nothing. From what you have described against a comparison of my own installation, I am certain you have 64bit Vuze installed. I have highlighted the parts of the log file that seem to confirm, at least for me, that Vuze64 is installed. Note, that Windows 64 bits, when using a 32-bit application, it shows the application name the name of the final '32 -bit ". For Windows 7, the application name, the end comes the suffix "* 32" or the like. "java.vm.name=Java HotSpot 64-Bit Server VM"
2. 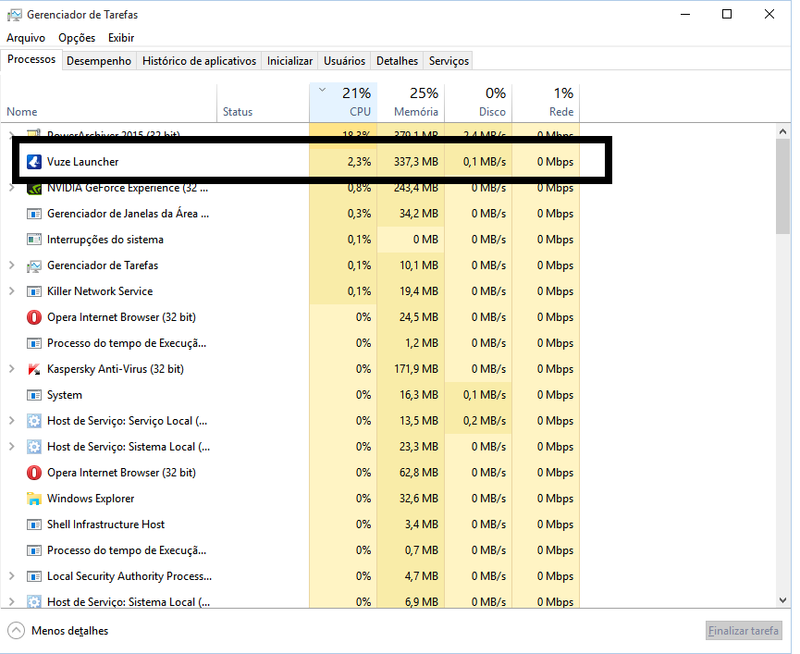 Task manager shows "Azureus.exe" (no *32 suffix). Thanks for helping me confirm that the install was successful. Now, as you say, I can "rest easy". If you've been running computers for as long as I have, I'm sure you know exactly why I am a skeptic. With computers (both hardware and software) I have learned by experience not to "assume" anything... Having Help>About report "SWT v4508, win32" is by no means comforting that you are running 64 bits on all cylinders (I still have no idea why Help>About reports a 32bit win32 component). Thanks a bunch to all who helped with this issue and best wishes .